Some people understand the cost of living by the price of bread or milk or McDonald’s hamburgers. For me, it’s ricotta. A staple in my kitchen, I could not live without the stuff. Fresh, soft and still warm, I cannot resist scooping a few teaspoonfuls out of the container while I’m putting away the shopping. Days later, I’ll eat it with jam or honey on toast, with spinach in a pie, on spaghetti with eggplant and tomato, or stirred through pasta, made into a sauce with a bit of hot water, a handful of parmesan, a grating of nutmeg and a sprinkle of pepper. Comfort food at its best. But back to the index. When I lived in Leichhardt, in Sydney’s inner west, I used to buy ricotta for around $7.99 a kilo. Later, when married life saw me move to the food wasteland that is Maroubra Beach, I had to make the admittedly-short journey to Maroubra Junction where I paid a shocking $10.99 a kilo. Still, I realised I was better off than the poor ricotta-ripped off in Manly who were paying $15.99 a kilo. As for David Jones, in the city, they were suffering and continue to suffer similar stupid prices for a product that is not even a cheese – rather it’s a by-product of it. In Melbourne, my home town, at the much loved Footscray Market, you can get it for $4.99 a kilo. And that, right there, is why I’m moving back to Melbourne. All of this, however, got me thinking about when this most versatile of dairy products made its debut in the great brown land of Australia. …in which there are “cappelletti”, little cases of macaroni in the shape of hats, which contain a mixture of meat, brains, and “ricotta”, a kind of cream cheese. It’s not till 1943 that there’s evidence of my favourite whey-based product for sale. The Cairns Post features an ad for Brightways Grocery where I would’ve been able to pick up 2 pounds of ricotta for sixpence. I’m not sure where that would sit on the index today, but what is surprising is that ricotta sits amongst the not-very-Italian ingredients of gooseberry jam, beetroot and the mysterious-sounding luncheon beef. Perhaps the reason this ad wasn’t more targeted at the small Italian population of North Queensland was because many Italians there had either just been released from internment following Italy’s surrender to the Allies, or they were still incarcerated. Either way, anti-Italian sentiment in Queensland was running high. AAAAAA. TELL YOUR ITALIAN FRIENDS we have now BACCALA, Coppa, Bologna, Salame, Ricotta, Olio, Polenta. THE PANTRY, 37 Elizabeth St. In the 1960s, ricotta became an ingredient that was featured in the odd Australian Women’s Weekly recipe, usually with the caveat that it could be substituted with either cottage cheese or cream cheese. This ad appeared below an advertorial recipe for Heavenly Cheese Cake, which featured creamed cottage cheese, on 28 December 1966 in the Australian Women's Weekly. The preoccupation with making sure the public understood that ricotta was now Australian continued into the late 60s. 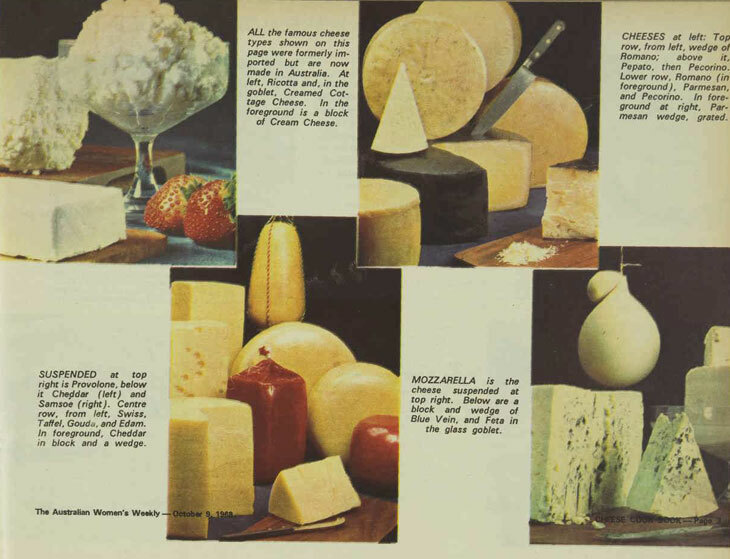 In a 1968 cookbook add-on about cheese again in the Australian Women’s Weekly, ricotta is one of many cheeses featured. Its provenance is given as “Italy” and we are told it cost “about 50 to 60 cents per lb”, however we are also told that it was one of many cheeses that used to be imported but was now made in Australia. Ricotta cheese is in the top left corner behind the glass of cottage cheese in this editorial spread from The Cheese Cook Book, an add-on to the Australian Women's Weekly on October 9,1968. This brings us up to the 1970s which brought us flares, punk rock and a constitutional crisis. But you’ll have to wait for Part 2 to find out what happens next in ricotta’s journey from a cheese for the eye-talians to a common ingredient many of us eat and cook with all the time. Bet you can’t wait, right? “Christmas at Rome.” The Mercury,5 February,1930, 4. “Brightways Cairns.” Cairns Post, 30 September, 1943, 2. “AAAAAA. TELL YOUR ITALIAN FRIENDS.” The Mercury, 14 January 1954,19. “Heavenly Cheese Cake.” The Australian Women’s Weekly, 28 December 1966, 6. “Cheese adds that gourmet touch.” in The Cheese Cook Book in The Australian Women’s Weekly, October 9, 1968, p 2-15.